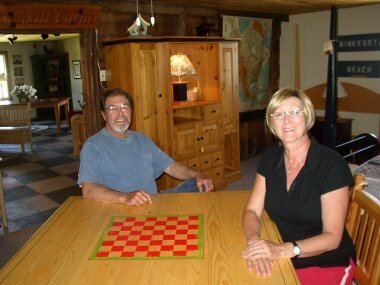 Roger and Shari Krause started Pine Mill Farm Furniture Company in March of 1989 with an order of 425 rocking horses. It took almost 6 months prior to get that first order, but when we did, we hit the ground with our feet running. Our company built over 7000 rocking horses in the first three years; and then began developing a small line of furniture which turned into quite a number of basic pieces, which you can see in our catalog. Since then we've been building customized variations on these basic pieces. Our customers bring us different ideas all of the time, which make things a little more exciting. We use solid wood, all pine, from Minnesota and our western states, and we are now working in all species of hardwood. We can stain or paint your new piece of furniture just the way you like it. Our finish is as smooth as silk and very durable. We restore antique furniture. Come visit us sometime if you are in the Ottertail, MN area, it is quite lovely.